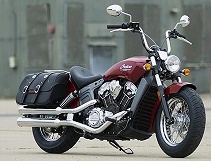 Polaris Industries (PII), the maker of Indian Motorcycles, has been on my radar screen the last 6 months and my recent experience of seeing (and riding) an Indian Scout motorcycle has motivated me to perform a more detailed analysis as a dividend growth company and it also became a worthy addition to my watch list. PII is best known for producing off-road vehicles and snow-mobiles and as such remains it bread and butter for revenue and earnings. Over the last six years PII has also moved into the motorcycle market with its Victory, three wheeler Slingshot and the more recent Indian Motorcycles which it acquired the rights to in 2011 and introduced their first models in late 2013. PII’s latest market venture is into a sector they refer to as Global Adjacent Markets. 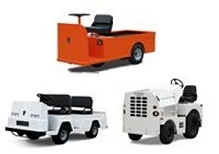 This new venture focuses on vehicle to be sold globally that specialize in moving people and supplies. This is a new strategy for PII as their other markets are dependent on consumer discretionary spending but the global adjacent market is dependent on commercial and industrial spending which is a slower growth but more stable market. While some may disagree with their latest investments I believe it to be prudent to help even out earnings during the peaks and valleys of consumer discretionary spending. In regards to competition, PII’s chief competitor is CAN-AM and to a lesser degree Artic Cat (ACAT) and Harley Davidson (HOG). There are smaller competitors but when it comes to off-road vehicles the three top names in the business are Polaris, CAN-AM and Arctic Cat. Some would argue that Harley Davidson should be on this list due to PIIs entry into the motorcycle market but PII’s $0.7B annual revenue is nowhere close to HOG’s annual revenue of $6B. Possibly one day in the future they may be head to head competitors but for now PII has a long way to go. 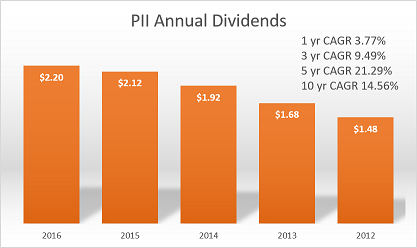 As a dividend grower PII has been paying and growing their dividend for 21 consecutive years with a 10 year CAGR of 14.56%. As impressive as their historical growth has been their most recent increase was only 3.77% which may or may not indicate future problems. Like any investment we shall perform the due diligence of analyzing PIIs annual financial statements to understand if the dividend is on solid ground and opportunities for dividend growth. Note: The following financial analysis is based on PII’s 2015 annual report. The quick ratio is of mild concern as it is dependent on liquid assets (cash, cash equivalents, and accounts receivable). If the company experiences a significant downtrend greater than six months this could cause an issue. But their ability to improve how many days it takes to collect receivables has improved dramatically over the last three years and this does offset some concerns. The Days to Sell Inventory measure is also one of concern as that number has consistently trended upward. Digging into the annual report, the issue with inventory lies with their production facility in Spirit Lake Iowa which cannot meet demand. PII has recently opened a new facility in Huntsville Alabama which should reduce some of the demand at the Spirit Lake facility in the second half of 2016. If inventory numbers do not improve then it may signal more hidden problems in their manufacturing and assembly operations. PII has solid profitability measures all around but if we had to pick on one it would be growing the revenue by only 5.33% in 2015. PIIs revenue stream was impacted by two factors. The first is a slowdown in sales of Off Road Vehicles (ORV). As shown in the chart below, the ORV segment has slowed down and even retreated a bit in 2015. This slowdown did not just impact PII but the industry as a whole with competitor ORVs experiencing the same downturn. PII has recently issued their 2016 first quarter earnings and ORVs sales were down from last year and may be a forbearer to overall lower 2016 revenue for the segment. The second factor of small revenue growth is again the issues of production capability at the Spirit Lake facility. Indian Motorcycles and the Slingshot three wheeler demand was stronger than expected and the facility could not meet demand. With the Slingshot model being moved to the Huntsville facility during the second half of 2016 it should open up space to produce more Indian Motorcycles. While PII may not have the greatest cash position on its balance sheet it does have relatively low debt which in turn provides fantastic numbers for their interest rate coverage ratio. An area you cannot fault PII is that they are always putting money to work through Capital Expenditures, R&D, or Acquisitions. Though the last 3 years of acquisitions have been primarily in the Global Adjacent Markets which as stated earlier is not a growth industry but one that will hopefully provide steady earnings to offset peaks and valleys of the consumer product sales. An area of growth concern that cannot be seen in PIIs financials lies within their motorcycle segment and more specifically Indian Motorcycles. Indian products have seen phenomenal growth in the short time they have entered the market but their largest hindrance to growth outside of manufacturing is the network of dealers. PII has approximately 200 authorized dealers while in contrast Harley Davidson has approximately 1500 dealers. Furthermore, Indian dealers are not even located in all of the lower 48 states and many consumers have had to travel across state lines just to make a purchase. Overall I would love to see a reduction in their share buyback program and instead roll that money into a new dealer incentive plan to grow their dealer base and improve existing dealer facilities to provide a better buying experience for the consumer. PII’s 5 year P/E average is 20.42 so its current share price is well below this with a current P/E of 13. Though I would discount the 5 year P/E average as there may have been a bad assumption that PII can continue to grow their ORV sales and investor expectations for Indian sales may have been overhyped. A more reasonable P/E range would be in a range of 12 to 16. In the short term, PIIs primary catalyst for growth lies within their Motorcycle segment and ability to produce enough product to meet demand. In the long term, the Huntsville facility will eventually get to 100% capability and decent growth should return again in 2017. Their 2015 overspending on inventory ate into profits indicating the 1 year 3.77% dividend growth rate will not be the norm once expanded production comes online. The dividend is well funded and if necessary they can dial back their investments to increase free cash flow. Overall I rate PII a buy but based on your savings or income goals your target entry price may be different than mine. Personally I am a strong buyer if the stock price dips below $80/share and may initiate a small position if the price drops near $82/share.